All along, I bluffed YQ that we are going to Changi beach to pitch tent. He didnt know that I had make a reservation at Hotel Re! As YQ was driving, I had to bluff him that we are going to town first and when we reached Hotel Re!, YQ was surprised. Then I joked with him asking him whether he still want to pitch tent in Changi at night? I had a headache choosing a suitable hotel cos I gotta keep it within my budget. Spent quite some times browsing through the net and reading the forums. Initially I wanted to book another hotel but reviews were not good and was considering other options until I saw Hotel Re! promotion on the forum. I called and enquired without any hesitation. Recently staycation is getting more popular in Singapore as more Singaporeans staying in the hotels over the weekend. There is a list of hotels promotion for locals at Asiaone and another about Places to spend over the weekend. Currently Hotel Re! has a Re!laxation package @ $128++ for a superior room which includes American buffet breakfast for two and a 30% voucher for the hotel's restaurant Re!Fill which is valid until 30 Sep 09. As YQ prefer purple colour, I upgrade to a deluxe room which is $20 more. Hotel Re! is a retro theme hotel situated at Chin Swee Road. The 12 storey hotel was formerly Pearl's Hill Primary School which was closed in 2001. Each floor is coded with different colour - red, pink, yellow, orange, green and purple. While checking in, the receptionist give me a complimentary upgrade to the Business Club Room which comes with a window bathtub. Although the room is pink, why should I turn away this offer? =) It took quite a while for me to check in so the hotel needs to improve on this area. Our room is located on the 5th floor and I didnt know that we got to slot in our room card to board the lift. ><" However the room card only allow me to access to the 5th floor and not other floors which I thought of exploring. The first impression I have when I opened the room is that it's extremely pinkish. The bathtub overlooks the Pearl's Hill City Park. The surrounding are all trees so no worries about being peep by anyone while bathing and the window blind can be drawn down. The room comes with a 42 inch LCD TV, a safe box, mini fridge and free wireless access. There are also 2 bathrobes and 2 slippers inside the wardrobe. There are two white Marilyn Monroe images on the pinkish wall at the head of the bed. The room is neither small nor big and yet there is sufficient space for us to walk around. We took a rest and head out for dinner at around 6plus. I had previously make a reservation at "My Secret Garden" but YQ fall sick recently and had been coughing quite badly so I got to have a backup plan. In the end, we went to "Sun with Moon Restaurant" at Wheelock Place for dinner. We were guided to a table with cushions and I find it quite cosy here. Well, the ambience there is nice but the food is not really nice. We found them too salty to our taste. I found that it's pretty hard to find a nice ambience restaurant with good food. We went to Shaw House Isetan supermarket to buy some drinks and tibits for supper before returning to the hotel as I did not really eat to my fullness during the dinner. We thought that we could watch the soccer match between Middlesbrough and Man U but the cable TV did not feature the channel that was screening the match. YQ then watch a tennis match. I had no interest in the match so I surf the net for a while before I went to bath. After YQ's bath, we lighted the candle and finally YQ had his wish of blowing the candle. I brought a small bottle of sparkling rose wine too. The sparkling wine taste nice but I forget the brand as I bought it at the airport on my last overseas trip. We exchanged our present cos YQ owe me my present for so long. Was really surprised that he bought a Forever Friends Bear which is really huge. In return, I gave YQ a bottle of Hugo Boss perfume for his birthday. While YQ had his eyes glued to the TV on his favourite Arsenal team against Portsmouth, I had sushi and cup noodles for supper. I was feeling a bit tired and turn in first while YQ continued to watch the match. My long overdue bday present It's a Forever Friends Bear! Happy Bday dear! We woke up at around 8plus and went to the Re!Fill restaurant for our breakfast. I spotted the shuttle bus while YQ went to his car to change his slipper. There is a free shuttle bus from the hotel to Outram MRT, Orchard and Clarke Quay. 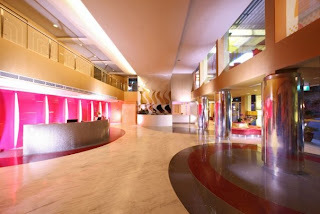 The Re!Fill restaurant is located on the ground floor which is adjacent to the reception counter. The breakfast is a mixed of western and asian food - toast bread, salad, omlette, cereals, porridge and noodles. After our breakfast, we went back to the room and have a nap. YQ didnt sleep well as he was coughing the whole night and I'm neither better than him cos he woke me up whenever he coughed. We took some last shots inside the hotel room before we check out at around 11plus as YQ has something on later on. I'm glad that YQ enjoyed his birthday so my planning for his birthday is a success, hehe. =) It's not a bad idea to stay in local hotels for special occasions or once in a while. Staycation is hassle free as one can avoid packing the luggage, catching a flight to the destination and planning the itinerary. I wouldn't thought of staying in a nice and posh hotel when I went overseas due to cost and most of the time would be spend outside the hotel room. I will definitely try the experience of staying in other local hotels whenever I need a staycation.